Check this page occasionally for seasonal sales and special offers. and two candlesticks! At BIG Savings! for just $18.00 = .36 each piece! Such a deal! Order Menorah Kits and get Dreidel Kits, any type, up to the same quantity, at 40 cents off the regular price. 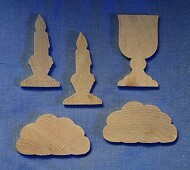 One Special price dreidel kit for each menorah kit ordered. 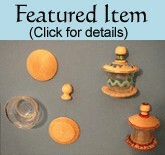 Click here for more Chanukah product info. Click here for more Havdalah product info.